Copy received from YABC and reviewed there. Cassie's mother is the town's chief of police, and Cassie's dog, Dodge, is a former police dog who is very well trained. When the town's richest man, Verdel Ward, disappears, a lot of people have a vested interest in what has happened. The mayor thinks he has left property to the town. A fiance comes to claim her share. The faithful housekeeper is just irritated that people keep trespassing on the estate. Frequent trespassers include Cassie and Dodge, who are trying to solve the mystery. Narrated alternately by the two, we get a dog's eye view of what was going on at the estate, and Cassie gets a lot of valuable clues from Dodge's sleuthing. Will Cassie's prodding get her in trouble with her mother, or will it actually put her in danger? Strengths: This was a great mystery for middle grade students. First of all, the main mystery was one where someone is suspected of being murdered, and that's what students are constantly asking for! The chapters narrated by Dodge included details a dog would notice, but were not annoying. Cassie's relationship with her police chief mother was realistic. 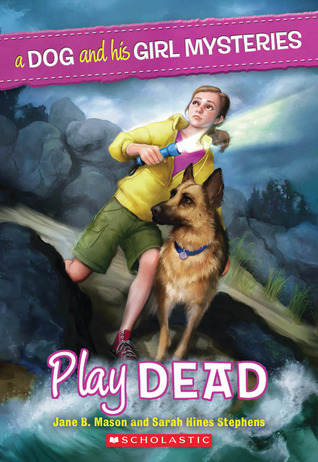 A subplot involving a stray dog that Cassie was trying to save at Pet Rescue came into the mystery nicely. I'll be interested to read the others in this series. 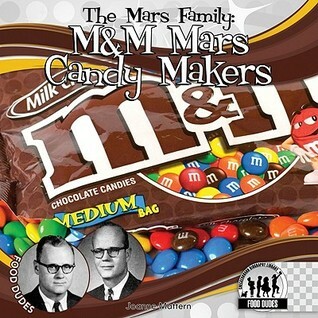 Weaknesses: I wish that this were available in hard cover! So many good mystery series come out in paperback, and those last so poorly in a school library. Jenn is a CIA agent who has been called to London to work with British operative Rob, who was involved in a previous case with her that result in her being shot by a terrorist called the Raven. Another agent has been shot, and the only words he said before going to the hospital are "Tuesday Raven". Jenn and Rob follow various clues, but are stalked by two dangerous characters. Will they be able to figure out what the cryptic words mean before something horrible occurs? Strengths: I just had a 7th grade boy who really wanted Tom Clancy books; this wouldn't be good for him, because it's a really short, hi/lo title, but I can enthusiastically recommend this to some of my struggling readers. Lots of good descriptions of London! Shalini's father has a great business opportunity that takes her family to Los Angeles. Shalini isn't thrilled about moving away from her large extended family in Bangalore, but her sister Sangita is thrilled. Her mother, on the other hand, is very upset. Shalini tries her best to fit in to high school life, but learning a new way of dressing and acting is difficult, especially when some of her classmates make fun of her. Even more difficult is being away from her finance, Vikram. Even though their marriage was arranged when Shalini was three, she has always adored Vikram, and Skyping is just not the same as seeing him in person. When she meets Toby and is attracted to him, she's very confused. Her friendship with Renuka, who was born in the US, helps a lot, especially when Shalini's mother becomes clinically depressed and requires medical attention. When Vikram comes to the US to visit, Shalini begins to realize that even though she is still not completely acculturated to the ways of the US, she is no longer the girl she was in Bangalore, either. Strengths: This was a fascinating look at an immigrant experience and its impact on the personal identity of a teenager. 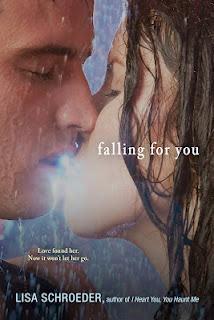 Even better, it has a great romance story, which will encourage girls to pick it up. The idea that Shalini is engaged at such a young age and okay with it is fascinating. I also liked that fitting in was much easier for her younger sister. Definitely purchasing this one. Weaknesses: The cover is a bit odd. Could have been so much better. Other than that, this was pitch perfect for me. This is just what I could find-- I imagine there are a lot more I missed! Caroline, Kit and Richard are sent rather hurriedly to their great aunt Amethyst's when their parents must go out of town for several months. Farthingdales is a huge but run down English manor house, and their aunt is having trouble keeping it from falling to bits. The children are intrigued by the house, especially when they find a snow globe with a replica of the house inside it-- a snow globe which is a portal into other times. They meet Michael, a boy from the early 1800s, as well as other people who lived in the house, and try to ask them about where treasures might be hidden so that their aunt can get some much needing funding to keep the house from ruin. Some of the people from the past are a bit shady, but when the children are stranded alone in the house when their aunt is caught up in a snowstorm, the ghosts of the past come through to save their aunt as well as Farthingdales. Strengths: **SIGH** A teacher found a copy of this book in her classroom-- we have no idea where it came from. When she handed it to me, I knew that I had seen it reviewed at Charlotte's Library, and it was all I could do to not sit down right in the middle of the school day and read it! I ended up waiting until a Friday evening, when I curled up in my favorite chair with a cup of tea and some biscuits and just wallowed in the old timey world of this one. For some reason, I adore snowbound books, and this had the added attraction of an English country house, lots of food, and "delicious" feather beds. I was so happy with those things that I was completely oblivious to the writing quirks Charlotte mentioned. Weaknesses: So much of what goes on would be completely incomprehensible to students today-- parents go off for three months because sea air is good for the father's health? Parents don't really tell aunt children are coming? House is falling to bits? There would be no point in putting this book in the library-- I guess I will just have to suffer and keep it for myself, in case I come down with a horrible case of flu and need some comfort reading! Okay. While I have decided that my reading tastes are that of a 12 year old boy, they are not that of an 8 year old boy. Still, because of my son's undying devotion to Captain Underpants, I did read the newest book, greatly motivated by the impression that it was the last one. Although I don't have a publication date, there is an 11th book in the works with the title The Tyrannical Retaliation of the Turbo Toilet 2000. This was time travel at its goofiest and most confusing! "When we last saw our heroes, George and Harold, they had been turned into evil zombie nerds doomed to roam a devastated, postapocalyptic planet for all eternity. But why, you might ask, didn't the amazing Captain Underpants save the boys from this frightening fate? Because Tippy Tinkletrousers and his time-traveling hijinks prevented George and Harold from creating Captain Underpants in the first place! Now, having changed the course of human history forever, they'll have to figure out a way to CHANGE IT BACK." 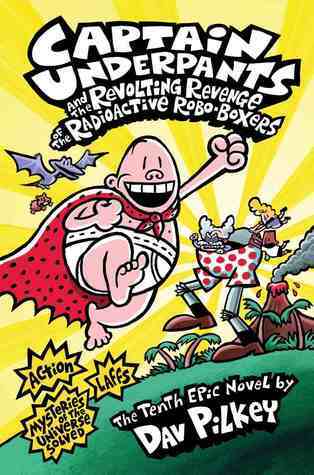 A note-- flip-o-rama does NOT work in e Books, although the Captain Underpants series is now available in that format. Just not the same! Here's a good list of the Youth Media Awards from ALA Midwinter in Seattle at the Sacramento Bee. My one story-- over a year ago, Katherine Applegate e mailed me and asked if I wanted to review The One and Only Ivan! (Review here.) It's been my number one pick to win the Newbery! Do I have the lovely copy Ms. Applegate sent me? No. I always feel funny about having ARCs and feel I should help the publishers get their money's worth by passing them along. I am SO glad that this book won. Well deserved, and given to a very lovely person as well! Amar'e is preparing for another tournament, and spending so much time practicing that his father is grumbling a bit that he doesn't help with the family lawn care business. The group of kids in the newest tournament are not very nice-- and when one purposefully pokes Amar'e in the eye, it puts him off the court for several weeks and causes him to have to wear geeky looking goggles. He puts the time to good use, though, putting his friends in charge of his training. He jogs with heavy back packs on, practices jumps, and gets a lot of conditioning in while letting his eye heal. Even his father recognizes how hard Amar'e is working-- but will it make a difference on the court? 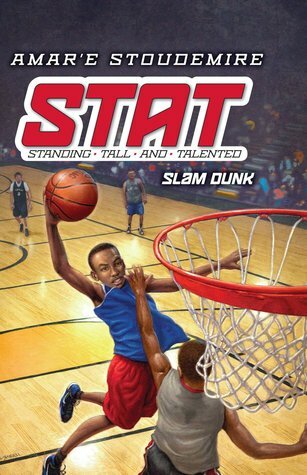 Strengths: I am always a little conflicted about celebrity authors, but there is no denying that Mr. Stoudemire knows his basketball and knows the type of books that basketball playing boys like to read. While the celebrity factor might make some readers pick this up, the story is solid enough that it will be a continuing favorite. This read a bit like Matt Christopher-- some personal issues, some issues with friends, but definite sports goals and lots of play by play descriptions. The back of this book says that it appeals to 3rd-5th graders, but I think that 6th and 7th graders will also enjoy this series. Weaknesses: I would have made the main character older-- elementary students would have still picked it up, but older students would have been more inclined as well. Small complaint. Bought this one at the request of several students and was not disappointed. Along with some decent duct tape projects, this book explains the intricacies of working with duct tape-- where to buy it, how to create "sheets" for larger projecter-- and is a good addition to my very small craft section. Can't get anyone to knit or quilt anymore, the macrame books are thankfully all relocated, so maybe this will entice a few students of both genders to embrace their crafty side! It's Marvelous Middle Grade Monday at Ramblings of a Wannabe Scribe and What Are You Reading? day at Teach Mentor Texts. Both sites have lots of links to reviews about books that are great for the 4th through 8th grader. It's also Nonfiction Monday, hosted this week at LaraSalas.com. We know that something horrible has happened, because the book starts with a scene in a hospital with someone hurt, then continues on with a chapter "six months earlier". Rae has to deal with her demanding, abusive step father and her ineffectual mother. She has a boyfriend, Nathan, but he soon becomes too possessive, and she drops him. The best part of her life is working for Nina in a florist shop, where she often sees Leo, who works next door. Leo is a good friend, but after Rae drops Nathan, she sees him as something more. Things go from bad to worse, with Rae's stepfather getting into trouble for gambling, and then taking off for a month with her mother. Luckily, Rae's job keeps her afloat. Nathan keeps giving her trouble, and she barely keeps things together at school and work. But we know that something is going to happen-- it's just a matter of when. Strengths: I knew right away that this wasn't really a middle school book, although there's really nothing objectionable. Half tempted to buy it, since Picky Reader would like it. Schroeder's writing is very intriguing, and I kept reading because there were so many things that I wanted to find out. Good stuff. Weaknesses: I could have done without Rae's poetry. I love poetry, just not free verse mixed in with my fiction. Poor Rae. Such a tough childhood, and then she wants to become a language arts teacher. In this sequel to If We Kiss (2006), Charlie is back, and the problem is that her crush, Kevin Lazarus, is now her step brother and living just down the hall from her, using her soap, eating dinner with the blended family, and generally making life uncomfortable. Fr a while, she tries to date George, but kissing him just doesn't have the zing that kissing Kevin has. She has other issues as well-- she's still trying to make things right with Tess, who was her best friend but who dated Kevin, trying to get out of the house so she doesn't have to watch her mother act weird with her new husband, and working at a local coffee shop. She does enjoy getting to know her nine year old stepsister, Samantha, but will Charlie be able to get used to her new family... and figure out what to do about Kevin? Strengths: My copy of If We Kiss is in tatters, so it's a good romance that the girls like. This one is also more of a high school, but doesn't have anything more than lots of kissing. May have to invest in the redone copy of the first book, as well. The problems with family and friends ring true. Weaknesses: High ick-factor for me. All I could think was "What happens when you break up with your step brother?" Nothing major happens, but since they do end up falling asleep in bed together, I could just imagine a third book in this series involving a LOT of family counseling! Beck has enlisted in the Air Force, where his intelligence has helped him learn to fix the airplanes. He is a "ranch hand" and works on a "provider". This means that he goes up in planes and helps distribute Agent Orange in order to defoliate the area, making it harder for the Viet Cong to hide. He is still very concerned about his buddies Rudi, Morris and Ivan who are also fighting in Vietnam. Beck is right at the front lines, and when his division takes some really hard hits, he is sent briefly back to the states for retraining, and then back to another unit to finish up his stay. Morris manages to arrange for all of the friends to meet, but Rudi is "too busy" going on optional patrols to join them, so the friends drive out to where he is stationed. 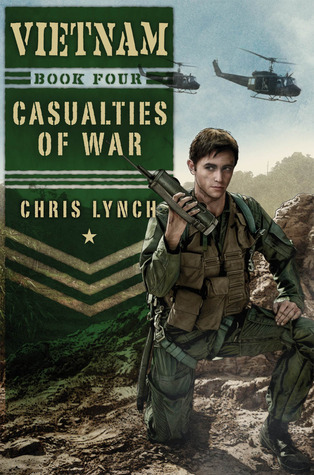 Rudi wasn't successful in school like Beck was; war is the one place that he can shine. How long can the four friends last in country before something horrific occurs? Strengths: This series filled a very big gap. There are not as many books on Vietnam as my students would like, and all four books give unflinching accounts of what war was like. It was interesting to have each book from a different perspective. No matter what Lynch writes, it's good, but these were especially awesome. Absolutely cannot keep this series on the shelf, and it's what that really needs to be read in order. Weaknesses: These are not for the faint of heart. People (including a main character) are killed in very graphic and bloody ways. This brief (48 page) book covers a wide range of topics. 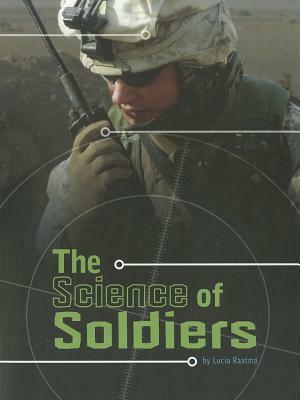 From nutrition and exercise science to the engineering behind weapons, equipment and food, advancements in technology and how they are related to military operations are covered in an easy-to-understand way. There are lots of things that I didn't know about-- SERE (Survival, evasion, resistance and escape) training, and different technologies used to help soldiers recover from wounds in the field might be topics that even the most well-versed boy interested in the military might not know. Strengths: I liked that so many topics were covered in one book. This would be a good starting point for further research; I imagine there could be an entire book on camouflage alone. Weaknesses: Tiny, tiny print. Since this is such a short book, I think some consideration should have been given to increasing the size of the type, since this is crucially important to middle school readers. 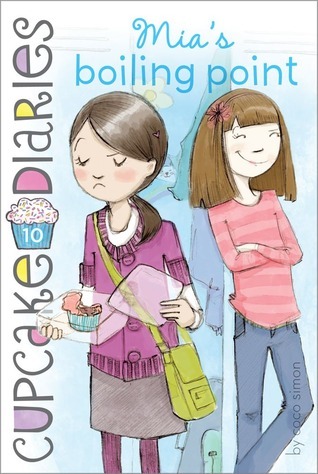 Anna is having trouble adjusting to middle school, and hanging out with her best friend Dorey doesn't help. Dorey doesn't care about being popular or about what she wears, and Anna is embarrassed to be around her. When the glamorous Jessamyn gives Anna a note to meet in a rarely used girls' bathroom, Anna is excited to be included in Jessamyn's secret group. 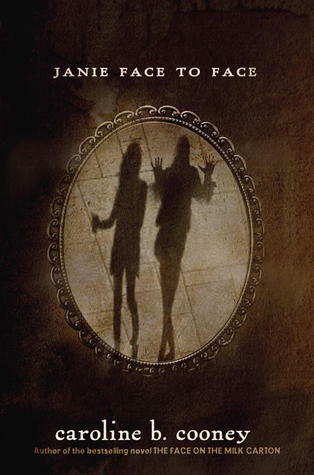 When she agrees to take part in their initiations and "calls on the spirits" in the bathroom mirror, however, she faints. Jessamyn and her friends think that Anna is dopey, but it isn't long before Anna meets Emma, who is dangerous and cool. The two eat lunch on the roof of the school, throw balloons filled with catsup at Jessamyn, and even go off campus. Emma is a bit of a mystery, though-- she doesn't answer her phone, and is elusive about details of her life. She is also very jealous, and when Anna talks to Dorey and her new lab partner, Benny, bad things happen to them. 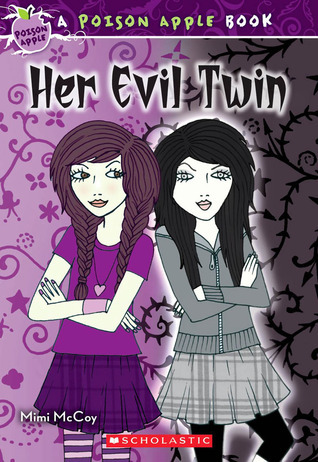 Eventually, Anna is blamed for things that Emma is doing and starts to wonder: is Emma really her imaginary friend from childhood, and has she always been this evil? Strengths: Anna's angst about being seen with Dorey is so true to life, and this is a pleasantly creepy tale. The 6th grade girls at my school adore all of the Scholastic Apple series: Candy, Poison AND Rotten! Weaknesses: Not enough attention is given to why or how Emma has managed to manifest herself. I always appreciate a little bit of an explanation. Abby and Lena love to go to thrift stores, and Lena is thrilled and surprised to find a working Polaroid Impulse camera for only five dollars. The woman at the thrift store doesn't want to sell it, but is eventually convinced. The only problem? There is the image of a boy that shows up in all of the pictures, a boy who wasn't there and who becomes clearer with every picture. Middle school is about to start, but Lena is bound and determined to get to the bottom of the mystery. 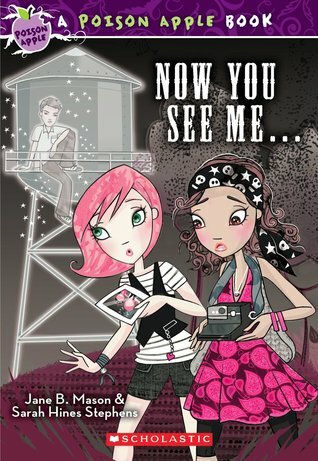 She and Abby consult the local library microfilm collections and find out about a boy who fell from the water tower in the 1990s and was killed... a boy who might just have owned the camera Lena has! What is his ghost trying to tell them? Strengths: I REALLY enjoyed this one! I think it was all the details... the thrift stores, the fact that Lena's father was obsessed with making jam, the sense of urgency about school starting, Abby being a girl of color, but this being inconsequential to the story. A nice, creepy ghost story, too, with a sad but hopeful ending. Weaknesses: It's great that Lena's cousin mistakenly got Polaroid film for her-- if she needs to buy any now, it would cost her $60 for ten exposures! Still, the old technology works for now. 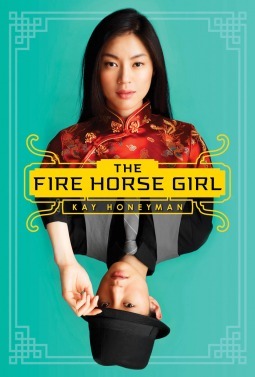 Jade Moon is the most troublesome kind of girl to have in 1920s China-- strong willed and adventurous, true to her birth year of the fire horse. With her mother gone, her father struggles to keep her in line, but when he is approached by a friend of his dead brother to go to America, he thinks this might be the answer to Jade Moon's problems. Sterling Promise has the brother's papers to get into the US, but Jade Moon and her father have to memorize the family history for when they will be grilled on Angel Island. After a long sea voyage, the trio arrives in the US, but the officials are not happy with their story and don't want to let them into the country, especially Jade Moon. Women are only brought in from China if they are going to be prostitutes or wives, and Jade Moon finds out that her father has made plans for her to marry. Seeing the plight of a woman she meets while being held at Angel Island, Jade Moon makes the daring decision to escape dressed in Sterling's clothes and plans to make her way to the home of a woman from the ship, Mrs. Ying. She manages to escape, but finds that the Ying family is no longer at the address she was given, and in order to survive, she falls in with a gang! Not sure of what else to do, she works under their guidance for a while, and then finds out that her insider's knowledge will be useful in taking down some gang related houses of prostitution! Finally, Jade Moon's personality works to her advantage. Strengths: This was a very interesting story of a little explored area of US history. I love the cover, and Jade Moon was a great character. Many times, strong girls are put into historical novels and seem anachronistic, but I thought that the personality was realistic, and the way that Jade Moon reacted to her circumstances was reasonable. I enjoyed this one. Weaknesses: More of a young adult book, especially when the prostitution plot line arises. Not that there's anything inappropriate, but the book's length and emotional complexity are more suited to high school. Thanks for joining us for World Wednesday. If you have a post about a middle grade book set in another part of the world or with great multicultural characters, please leave your link in the comments. I love Timeslip Tuesday at Charlotte's Library! Any excuse to read a time travel book! Gwen is back after her adventures in Ruby Red, and embroiled in a mystery-- what are Lucy and Paul up to with the second chronograph? And what about Gideon? Does he really like her, or does he have ulterior motives? There are so many secrets that the Guardians have, and it's difficult to find out the truth. She does manage to meet her grandfather back in the 1940s and 1950s and talk to him about what might be going on, and her best friend Lesley is doing all she can. What doesn't help is her snotty cousin Charlotte who has been trained to time travel and is very disappointed that she isn't able to. When Gwen has to travel back to the past and attend soirees and talk to the possibly evil Lord Alastair and Count Saint-Germain, things become even more complicated. Will she ever figure out what the purpose is to all of her time traveling? Strengths: The great covers on these, and the romance within, makes this a good time travel book to give to girls who like paranormal romances. Since my heritage is 80% German, and I lived for a long time in Cincinnati, Ohio, I knew a little bit about the treatment of Germans during WWI, but not nearly enough. This was an absolutely fascinating look into a little mentioned topic! At a time when a quarter of the population had German roots, the sinking of the Lusitania by a German U Boat had horrible ramifications. You may have heard how streets with German names were renamed, and dachshunds were called "liberty dogs" for a while, but I had no idea that right here in Columbus, dachshunds were killed! Authorities looked the other way when German owned businesses were seized, and, most importantly, civil liberties were impinged upon in the same way that they were after the 9/11 bombings. The author does a good job at making WWI relevant to students today by comparing events to 9/11, and there are some nice after notes about war time presidents that are very helpful. Period photographs, drawings and propaganda add much to this book. Jung, Mike. 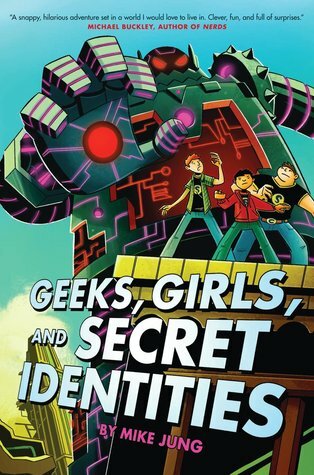 Geeks, Girls and Secret Identities. Vincent Wu is one of three members of the Captain Stupendous Fan Club-- not the "official" one, but the one he and his friends Max and George think is most important. Because of Captain Stupendous, Copperplate City has been a relatively safe place, but Professor Mayhem is on the loose with a giant robot. Captain Stupendous doesn't seem to be on his game in working against this threat of evil, and Vincent soon finds out why-- the first Captain has been replaced by a girl from his school and the object of his affection, Polly. Polly doesn't want to be a superhero, but doesn't have a choice, especially when Vincent's mom, the district superintendent is taken hostage by the evil professor and the entire town is in jeopardy. Can the Fan Club help Polly polish her powers, defeat the professor, and come to terms with her new skills? Strengths: I am glad this made the Cybils short list-- it was awesome. Everything that my students are looking for in a book, AND here is a video clip of Mike Jung playing the ukelele over at The Book Nut! I love it when books show very clear attempts to figure out what kids WANT TO READ!!! Super heroes are a huge thing now, and this had so much more. A great romance, strong female protagonist, faithful sidekicks, compelling use for Vincent's encyclopedic geek trivia. 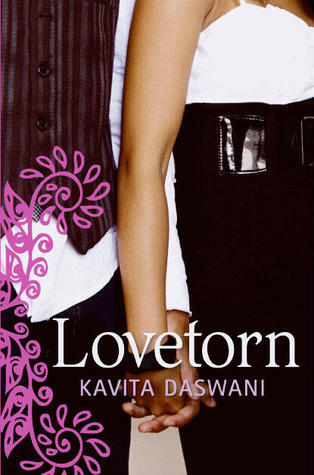 There are even characters who are incidentally of Asian descent and appear on the cover. Bonus! If this were not enough, the writing was excellent. Even with no explanation for the existence of Captain Stupendous, I was sucked right into the book, and marvelous turns of phrase abound. Isn't Mock Apple Pie a GREAT rock band name? Weaknesses: Professor Mayhem's motivation seemed weak to me, not that it really mattered. I want to go learn to play the ukelele. Or the banjo, whichever students would find most annoying! 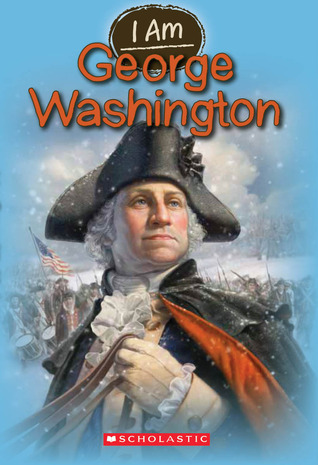 As much as I would like my students to pick up and read Carla Killough McClafferty's The Many Faces of George Washington: Remaking a Presidential Icon, I know that the length of that book is daunting to many. The books in this Scholastic I Am series are just the right length for 3rd through 8th graders to pick up and actually read the entire thing! Not only that, but they are fast paced and full of the most interesting bits of history about the person. The George Washington title is no exception. Unlike the Childhood of Famous Americans series that I so adored in elementary school, the I Am series discusses a little bit about the person's early years but is more concerned about their contributions to history. While I wasn't thrilled with the accompanying illustrations, they are a good addition for the target demographic, who might not have a mental picture of what the world looked like during Washington's time. With the new emphasis on nonfiction reading with the Common Core Standards, these books are a great way to get kids reading nonfiction without it feeling like nonfiction! If my own children were younger, I would certainly encourage them to buy these through the Scholastic flyers their teachers would send home. Sometimes, I get tired. Not of reading, but of writing reviews. I have NOT wearied of the Cupcake Diaries series and really enjoyed these two, but decided to treat myself to not writing a review. Also worked on a quilt for a baby shower instead of reading every second of the day I wasn't doing chores. Sometimes, it's important to mix it up a little! Have high school students who swoon over Downton Abbey? Here is the perfect book for them! Rasheed, Leila. 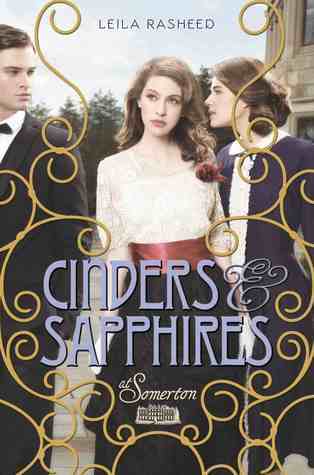 Cinders and Sapphires. Somerton is buzzing with activity. The Averly family is back from a post in India, and Lord Averly is getting married to Fiona Templeton. This means that his children, Ada and Georgina, have to learn to get along with the beautiful, cruel and ambitious Charlotte, the rake Sebastian, and the boisterous Matthew. Ada wants nothing more than to go to Oxford to study, especially since the attractive Ravi, a protege of her father's friend, also goes there. She is pressed, however, to make a good marriage. Add to the mix Rose, Ada and Georgina's ladies' maid, who has risen from the ranks due to her mother's influence. But why is Mrs. Cliffe so favored? What past does she share with Lord Avery? Will Ada be able to help Rose with her music, keep Georgina from harm, keep away from Ravi, help Sebastian cover up his missteps, and, above all, keep Somerton from financial ruin? And can she do it all in the latest fashions? Strengths: I really, really enjoyed this. Tons going on, but I was able to remember most of the character's names even from an e book! Very atmospheric, full of the "We're adhering to the social protocol even though it's breaking our hearts" sort of book that makes for a fun read. Weaknesses: A bit cliched. We have Sebastian being black mailed for an Oscar Wildesque type fling, the suffragist sister, the overbearing stepmother, the all important debut, the grand estate on the verge of financial ruin. Still, to most high schoolers, this will be new. Nothing really objectionable, but the emphasis on Sebastian's troubles would confuse middle school students, I think. Half tempted to buy it, still, because it was such fun, but really would be of limited interest to younger students. Charles Nukid is back after Scary School, and after freeing most of the school after they've spent the entire summer in the basement of a haunted house, is off with the school on a trip to Albania to visit Zog the Terrible (But always pleasant smelling). The school has won the trip, but it is fraught with peril-- Zog is a stickler for etiquette, and will maim or kill those who disobey! This is particularly difficult for Charles, because he has made Zogett, Zog's daughter, fall in love with him, thereby breaking the rule against taking things from other monsters. There's a lot else going on in the school, what with a mummy and elephant/man for teachers, and things like the Locker of Oblivion absconding with students. 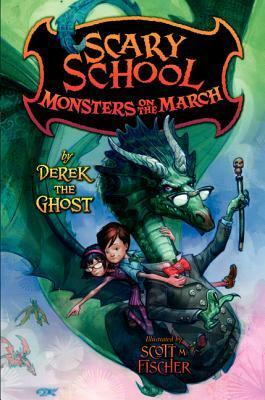 Additional chapters, games, and other fun things can be found at http://www.scaryschool.com, a fact that Derek the Ghost (the "ghostwriter") mentions several times. 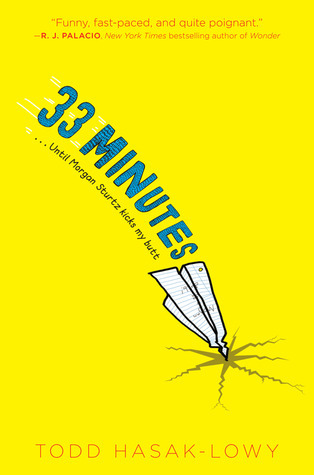 A third book comes out in June 2013. Strengths: There are few monster books, and the first book has been popular. I had a lot of kids asking for the sequel already. This is goofy and would be immensely popular in the elementary school. Weaknesses: While there was a plot, there were a lot of anecdotal chapters about the characters. Thanks for joining us for Guy Friday. If you have a post about a middle grade book for guys, please leave your link in the comments! Janie's been through a lot in the last few years. When she became The Face on the Milk Carton (1990) it was bad enough, but once she dealt with the fact that her parents were not really her parents, she had to figure out Whatever Happened to Janie (1993) and reconnect with her birth family, the Springs. When her boyfriend, Reeve, decides to be The Voice on the Radio (1996) and propel himself into on air popularity by telling Janie's story, Janie's path was clear-- dump him. But when What Janie Found (2000) later was that her "kidnap" father not only knew where his daughter, who kidnapped her, was, but also was sending her monthly checks, the path was less clear. This brings her to her decision to apply to a college where no one knows her story so that she can establish her own identity. This starts off well-- she is able to visit the Springs on some weekends, and Miranda and Frank, the couple who raised her, on others. She keeps in touch with her old friends, but is glad to make new ones. She is especially fond of Michael, and eventually falls in love with him. Problems arise, however, when she catches him taking an unflattering picture of Frank and realizes that he is working for a writer who is paying him to research Janie's case for a tell-all book. She reconnects with Reeve and, on a whim, visits him at his job at ESPN. They decide that they are still in love, and impetuously plan to be married very soon. Everyone is happy for Janie, who decides that her marriage will be the point at which she turns back into Jennie once and for all. However, always lurking in the background is Hannah, who for years has led a marginal and dysfunctional life, afraid of being caught for her kidnapping of Janie and harboring years of resentment, especially since she no longer receives checks from her father. She is currently in Colorado, and Janie's brother tries to find her before the wedding, since he fears that Hannah will somehow find a way to take her retribution at the wedding. Janie is less concerned with Hannah and more concerned with finding a gown, making all of her parents happy, and forming a new life with Reeve. Events swirl around her, but her main goal is to try to figure out, finally, who she is. The entire series was republished in attractive new paperback editions in May 2012 by Random House's Ember imprint. Language Arts teachers everywhere will be pleased. Strengths: The continued success of this series hinges on the fact that it involves a topic dear to every middle grade students' heart-- personal identity. How many of them secretly wish-- or fear-- that they are not the person they think they are? Since the series has been out for such a long time, I think that having Janie in college and thinking about getting married is not a bad thing. I read a lot of 1950s books (Sister of the Bride, etc.) that dealt with girls getting married, and was always somewhat intrigued by them. I think the same will hold true of this series. Cooney was able to work new technology into each book, and was able to sustain a coherent feeling throughout the series. Weaknesses: At first, I was a little bothered by the somewhat detached tone of the book, and went back to see if the other books in the series had the same feeling. They did, and I think it illustrates well the way that Janie feels disconnected from her own life. This is co-hosted by one of my favorite bloggers, MotherReader, who hosts the fabulous 48 Hour Reading Challenge that I love to do every year! Sparrow (aka Sameera) was adopted at the age of three from Pakistan by politically active parents. Her father is now running for president, hoping to get his party's nomination. There is a lot of concern that Sparrow isn't "American" enough, or fashionable enough, to help sway votes. She is reinvented as "Sammy", made over to be more attractive, and given a custom blog aimed at tweens, even though she is 16. She is uncomfortable with these changes, but understands that even her mother has had to undergo "improvements". When it's clear that she will no longer be able to enjoy quiet times with her family on her grandparents' Ohio farm, she tries to embrace politics herself, connecting with students in Washington who are part of the Southeast Asian Republican group. She has her own private blog, but when the group wants to help the campaign by using Sparrow's writing, she has to decide what will help her father the most. Strengths: This was a great book for middle school students. Deviller's Liberty Porter series is a tiny bit young, but Sparrow's experiences will be interesting to students who wonder what it would be like to be in the public spotlight. Certainly Sparrow's ethnic identity plays a large part in the book, but I think that readers will pick it up for lots of reasons.I do not know how I missed this one! 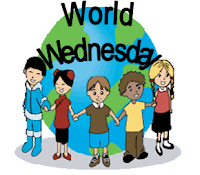 Thanks for joining us for World Wednesday. If you have a post about a middle grade book set in another part of the world or with great multicultural characters, please leave your link in the comments! Orphaned Jayna is in a difficult position when her older brother and guardian, Rob, is sent to fight in World War II. She's fortunate that their landlady, Celine, is willing to take her in, because Jayna has spent some time in foster care. Jayna isn't happy, though, and knows that having her is a hardship for Celine. Before he left, Rob gave her a cookbook he found that lead him to believe that they may have a grandmother in Brooklyn who is running a bakery. Armed with this book and a little money, Jayna takes off for the city with her turtle, Theresa, goaded on by a ghostly voice. 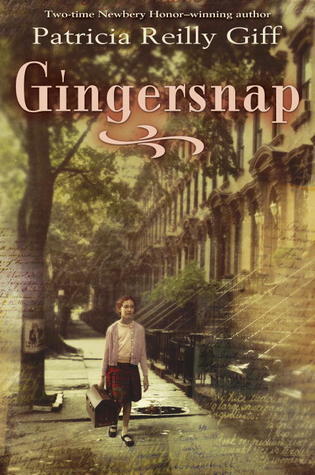 She finds the bakery, Gingersnap, and meets the woman whom she thinks is her grandmother. She begs to be allowed to stay, and finds out some information about her family while she waits to find out the fate of Rob, who is reported missing in action. Strengths: This certainly shows how different a place the world was 70 years ago! 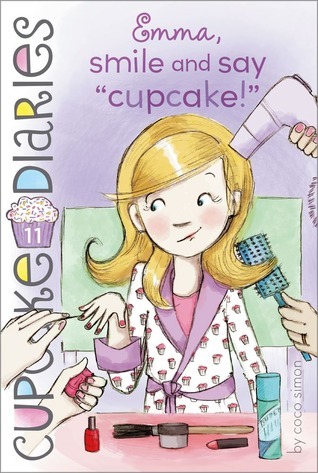 I enjoyed this glimpse into what life was like when the author was a girl. Weaknesses: I love books set during this time period, but my students want books that are about fighting, NOT about the homefront. If I can't circulate Lowry's excellent Autumn Street, I don't have high hopes for this book. Robert is back from his adventures in Professor Gargoyle, and his school is still a portal into the alternaverse of Tillinghast mansion, where the evil Crawford Tillignhast has been caught and is summoning the Great Old Ones to take over the world. 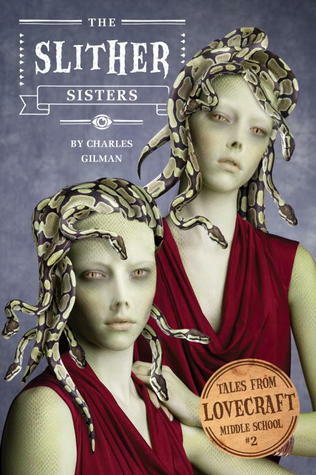 The newest victims in his scheme are the Price sisters, whose bodies have been taken over by Medusa like creatures. In order to control the middle school students, Tillinghast is having Sarah run for student body president. Robert and his friends Glenn and the ghost Karina, aided by the librarian, Ms. Lavinia, try to foil this by having Robert run, since Howard Mergler doesn't stand a chance at defeating her. The forces of evil are strong, but Robert is determined not to win. He manages to best the sisters, but a new foe emerges and will have to be battled in Teacher's Pest, coming out in May of 2013. Strengths: Again, a cool lenticular cover, and a Goosebumps type story-- scary, but nothing real. Robert is an engaging character, and there are some helpful teachers.Fast paced story with a good bit of action. Monsters are emerging as a popular topic. Weaknesses: Robert didn't manage to save the Price sisters, so I'm a little concerned that Tillinghast is winning this battle. I'm never a big fan of study body president plots, so I had trouble believing this was a good way to take over the world! Saw on Twitter (thanks to Jen Robinson) that boys are perhaps reading more with e readers. (http://mediaroom.scholastic.com/kfrr?utm_source=ReadingRockets.org&utm_medium=Twitter) I am just not seeing this. I've had to have three boys put away Kindle Fires because they were playing games on them, and when I asked what books they had loaded on the devices, all they had were things like Treasure Island and other oldies but freebies. It's been very difficult for me to help students with ebooks. Databases like the one for the Ohio E Book Project are becoming a little easier to browse, but many of the students who have e readers don't even have public library cards because their parents won't take them to the library! The avid readers who have devices often have purchased a good numbers of books, but they would have read anyway. Anyone wish to opine? I still think that cost is going to be a prohibitive factor just about everywhere. Sam is really smart and into video games, and was good friends with Morgan until a while ago. Now, for reasons Sam doesn't quite understand, Morgan is going to fight him at the end of recess. Thinking about their long relationship, Sam tries to figure out why things have gone wrong. Luckily for Sam, there is a huge food fight during lunch right before he's supposed to get his clock cleaned, and THEN someone sets off the fire alarm, which could save him from Morgan, but the teachers are not watching closely enough and the fight does occur. Sam also gets to talk to Morgan a little about why Morgan feels compelled to beat him up, and after his afternoon of thinking about the events leading up to his pummeling, Sam realizes that while he was partially in the wrong, he and Morgan will never be able to be friends again because they have become very different people. Strengths: Any notebook novel is popular in my school, and I did like that this addressed the number one concern of middle school-- losing long time friends. Happens to 99.9% of my students, and is always utterly painful. Interesting how the book takes place during just one afternoon, although flashbacks go back further. Weaknesses: I didn't like Sam. He was arrogant and not particularly nice to Morgan. This was also one of those books that seem unrealistic to me because things like the food fight and the fight during the fire drill would not happen at my school. 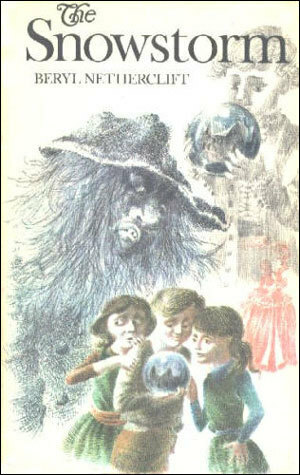 I could create a whole list of books that I didn't quite connect with that my students adore, though, so it's just an occupational hazard of never actually having been a 12-year-old boy. I rarely buy an entire series at one go, especially when the books are nonfiction ones that run $19 a pop. I bought the entire Food Dudes series by Abdo and Daughters, however. Every language arts teacher in my school is assigning nonfiction projects, and this series is fascinating. What student does not want to read about Gatorade, McDonald's, Kellogg's or Hershey's or Mars' chocolate? These are a bit short (32 pages), but full of interesting facts. I'm sure that once the Common Core is rolled out, these will be considered "too low" in regard to the Lexile level, but I still think that these books are an excellent way for a child who "doesn't like to read" to spend a study hall. 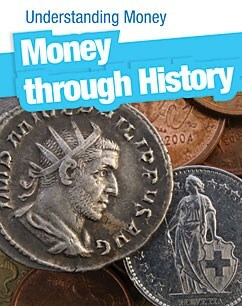 This short (45 pages) book is an overview of money through history and throughout the world. It starts with trade and bartering, goes through the introduction of coins and banknotes, and continues on with a discussion of different currencies and money systems used today. Strengths: Interesting nonfiction, and it has an Accelerated Reader test. Weaknesses: Not what I needed. I was hoping that there would be more on certain areas, but there are barely two pages on all of ancient Rome and Greece. The inclusion of "Solve It!" sidebars was a bit odd. It's Marvelous Middle Grade Monday at Ramblings of a Wannabe Scribe and What Are You Reading? day at Teach Mentor Texts. 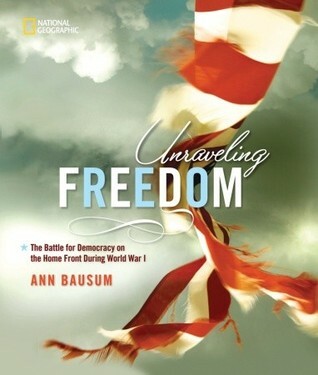 Both sites have lots of links to reviews about books that are great for the 4th through 8th grader. It's also Nonfiction Monday, hosted this week at 101 Scope Notes. If you need more memes, remember that there will be a World Wednesday Mr. Linky and a Guy Friday one later this week, so check back and join the party! 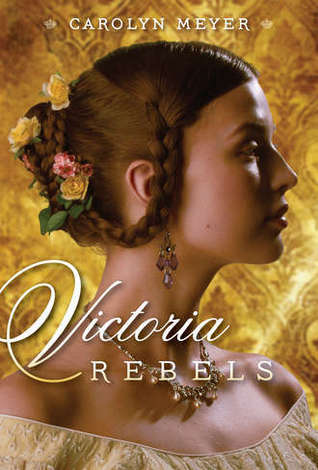 The young Victoria lives with her overbearing mother and her governess Daisy. Her father died when she was an infant, and her mother listened to her advisor, Sir John Conroy more than Victoria would like. We first meet her at a young age, when her step sister, Feodore, is preparing to get married and leave England. Throughout Victoria's childhood, her uncle, Kind George IV, is not in the best of health, so everyone knows that Victoria will soon be queen. Her mother uses this as an excuse to keep Victoria under her thumb-- dressing her like a child, making her stay in her mother's room, having her every move watched. Victoria is also introduced to Prince Albert, and is amenable to marrying him, but not any time soon. When her uncle passes away, Victoria is finally able to assert some power to chose the people with whom she surrounds herself (NOT Conroy, and eventually not even her mother! ), fall in love with Albert, and become the long reigning queen we know. Strengths: Like all of Meyer's books, well researched. This has the additional charm of drawing from Victoria's own journals, and hearing her voice ("I was much amused") is great fun. Enjoyed this tremendously. Weaknesses: When I got to the end, I wished for a family tree; there is one at the beginning that I missed upon opening the book. Very helpful to consult. I ***LURV*** Linda Gerber and her books! So, so much goodness. While I got the first book in her new series, Celebrity, and the third (Hacked), I was at the mercy of Follett and Baker and Taylor when I did Do Not Exceed orders, so had to wait for a while until I got the two books I was missing. When my dog Sylvie was ill a bit ago, what did I read for comfort? Only the best. Because of all the publicity surrounding Cassidy and her blog, the people who produce her parents' When in Rome cooking/reality show decide to send Cassidy off to GREECE to tape there. They are on the yacht of a Greek movie star, who happens to have a really cute son, Nikos. Cassidy's parents, as well as her friend/crush Logan are off filming in Papua, New Guinea, so Cassidy is chaperoned by her tutor, Victoria. The yacht is a rather tense place-- Nikos' father is rather controlling and always seems angry with Nikos, who is going to be cohosting with Cassidy. Zoe, whose mother cooks on the yacht, is smitten with Nikos, but there is something very strange about her and her mother working on the yacht. 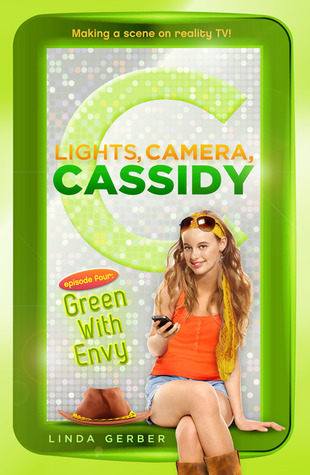 The Greek producer favors a style of filming that Cassidy finds fake, so she has trouble making the producer happy. Also, Logan seems preoccupied and doesn't seem as willing to make their scheduled Skype talks. 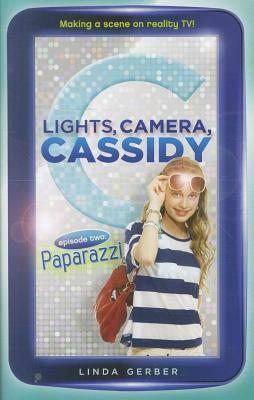 Cassidy prevails, however, finding out what's up with Zoe's family, and getting the show taped in a professional manner. Strengths: Greece! Sigh. I lived in Greece for a year, and Gerber does such a great job with travel writing, explaining local customs, food, etc. This is fun to read, because while Cassidy's life has a lot of excitement and opportunity, there are also realistic problems portrayed. Weaknesses: Not in hard cover. Really, Penguin Young Readers? Really. Shame on you! Cassidy and her parents are off to Australia to film at a ranch, and this time Logan is coming along! Cassidy is thrilled that they can be together, but a little less than thrilled when they are out and about and Logan has groupies following him! She is happy to meet the son of the ranch owner, Riley, who is good about showing her and Logan how much work needs to be done in the Outback, but a little less than thrilled to meet his sister, who finds Logan cute but is rather mean to her. The filming is not going well-- equipment gets broken, the two make up artists start fighting, and when the group heads off into the bush to film and get stranded overnight because vehicles are sabotaged, the crew and cast are fighting a lot, and the entire show is in jeopardy. Who is causing all the trouble? Strengths: I liked that there was more mystery in this one because it is Gerber's forte. Well, that, and travel writing. Lots of detail of life in Australia, plus some of the dialect. Weaknesses: Ever since Bill Bryson's in a Sunburned Country, I've not really wanted to go to Australia, because of the sheer amount of things that could kill me. Still, reading about it was pretty safe!